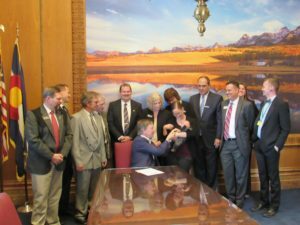 Governor Hickenlooper signed my first bill, House Bill 2017, into law today and I got my first bill signing pen! The bill clarifies the duties of county surveyors, seeks to make it easier for small counties to appoint in the event of a vacancy, and modernizes some pretty outdated provisions. It was great to have several surveyors join us for the signing, along with some close friends and one of my youngest new constituents! In other news, we’ve had another busy couple weeks at the capitol. The days and weeks go by so fast here that I can barely remember everything that has happened. My first bill has completed its journey through the legislative process. HB 1017 clarifies the responsibilities of county surveyors and the vacancy appointment process. 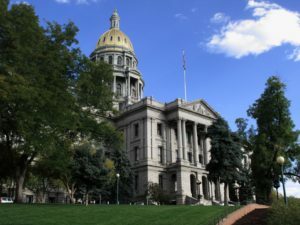 It passed unanimously in both the House and Senate, and after the House concurred with one minor Senate amendment, the bill is on its way to Governor Hickenlooper’s desk to be signed into law! Last Wednesday, I convened a stakeholder group to discuss my idea of streamlining inspections of affordable housing projects. I had previously introduced a bill, HB 1170, to address this issue, but I also knew this was a complicated enough issue that my bill might not necessarily be the right solution; legislation is not always the answer. In this case, we might be able to make more progress simply by keeping these stakeholders sitting at the same table and working things out. I may or may not move forward with my bill at this point, but I feel good about the conversation we’ve started. I also want to plug a bill I’ll be introducing soon on hospital transparency. Did you know that hospital care accounts for 37% of the total cost of our health care, and yet we don’t have great data about how this money is being spent within the hospital system? My bill – which already has significant bipartisan support – will require hospitals to report more data to the state so we can compile detailed hospital expenditure reports and identify more of the drivers of our increasing health care premiums. So much. Just yesterday, my Finance Committee passed a bill extending the childcare tax credit and another to refer a measure to voters to re-calibrate the TABOR growth cap. The Education Committee passed a bill to address a long-standing concern with 9th grade testing. Negotiations continue on a referred measure to raise revenue for transportation. We’ve also been busy defeating bad bills, like this one introduced for solely political purposes. I could go on, but I think I’ll leave it there. If you want to talk more, email me or call my office at 303-866-2951 or come to my meet-and-greet or office hours! One bill I’m particularly excited about will be introduced in the next day or so. In a conversation with the folks at Metro West Housing Solutions (Lakewood’s housing authority) last summer, I learned about an issue with duplicative inspections. Affordable housing projects often require public funding from multiple sources including state housing development grants (HDG), state and federal low-income housing tax credits (LIHTC), and federal HOME funds. Each of these public funding sources comes with tenant income-verification inspections immediately after occupancy and/or periodically over many years. So why can’t we streamline these inspections and cut some duplicates? My bill starts up a process of rulemaking to bring all parties to the table and get to work on streamlining these inspections. Lest you think that this issue is resolved, I can assure you we still need to fight every year to protect a woman’s right to control her own reproductive health. This Thursday, the House Health, Insurance, and Environment Committee will be hearing three Republican-sponsored bills going after abortion rights. One bill purports to protect women’s health, but in fact it is a way for the Attorney General to build a database and conduct surprise inspections on abortion clinics. A second bill requires abortion providers to “inform” women about abortion pill reversal, based on highly questionable and unproven science. A third bill defines life at the moment of conception, essentially outlawing all abortions – a state law clearly deemed unconstitutional under Roe v Wade and subsequent decisions. Read the three bills here. That’s going to be a really long night. I’m working incredibly hard on these and many other issues, but I gotta tell you – I dig this job. It’s such an honor to represent you all, and it feels good to be doing this work every day. Thanks for hiring me. You know, it’s funny. People keep asking me if I’m ready for things to get crazy when the 2017 Legislative Session begins on Wednesday, but the truth is things have been crazy since the day after Election Day. And I love it. Every day, I get to wake up and work on solving public policy problems. Whether I’m digging into research based on my own ideas and concerns or meeting with constituents and advocates to learn about theirs, it is truly a privilege to be in this position. Colorado is facing some pretty significant challenges right now. While the economy is growing, there are still too many folks struggling to keep up with the cost of living. Among our top priorities will be working to address the costs of housing, health care, child care, and more. At the same time, Colorado is in a very unique situation because of Constitutional constraints on our budget. As many of you know, Colorado is the only state in the U.S. in which the legislature doesn’t have the authority to raise taxes. Furthermore, our budget is restricted by a growth cap that doesn’t keep pace with the needs of our growing state. So, even as we grow our economy, we’re unable to adequately fund our public schools, transportation infrastructure, and other priorities. Furthermore, the rapid growth of home values has put the Gallagher amendment into effect for the first time since 2003. Essentially, this means we’re forced to reduce residential property taxes in a way that will cut education funding by $178M at a time when the state is already far short of it’s obligation to K-12. While we will certainly be searching for legislative solutions to many of these problems, some of them can only be addressed by amending the Constitution, which is now much more difficult because of the passage of Amendment 71. In the short term, that means Colorado will be making budget cuts. It is indeed frustrating that despite our growing economy we’re unable to increase our investment in many critical priorities, but it is also an honor to be in a position to fix the things we can and fight for long-term change. That’s exactly what I’ll be doing every day as your State Representative. Stay tuned for more updates soon on the bills I’m sponsoring and the work we’re doing in committee. Both of Lakewood’s House representative seats remained Democrat after the November election, with Chris Kennedy defeating Republican Chris Hadsall for the House District 23 seat with 23,872 votes to Hadsall’s 18,850. Current seat holder Max Tyler was term-limited. 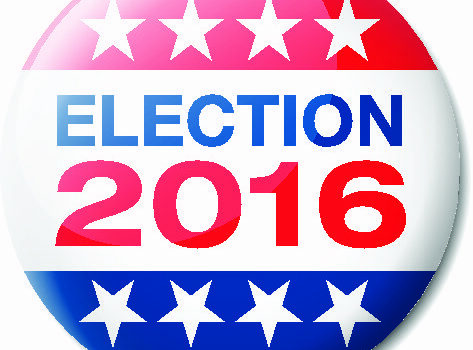 Incumbent Brittany Pettersen held off Republican Nancy Pallozzi in the race for House District 28 with 22,431 votes to Pallozzi’s 14,522. Read the full story at LakewoodSentinel.com. Jefferson County’s senators and representatives are looking forward to working hard in the Legislature and in their assigned committees this upcoming legislative year. Opening day of the 2017 session is Jan. 11. Read the story at ArvadaPress.com. One thing I have learned from my experience working on campaigns is that election night is always bittersweet. Last night was an especially difficult one for our country. After lying awake most of the night, I spent the morning trying to figure out the right way to move forward. The good news is that I’ll be moving forward as your next State Representative! As of this moment, I am winning 56-44 with very few ballots outstanding. A couple hours ago, my opponent called me to congratulate me. I thanked him for his commitment to service that led him to enter the race and go through a tough campaign. I am so thankful to all of you who made this victory possible. Whether you knocked on a few doors, donated a few bucks, or did anything else to help the cause, I couldn’t have done it without you! Thank you! Over the last month, I have been getting excited about the next steps. Tomorrow is my first day of freshman orientation, and I will soon begin setting up meetings with various stakeholders to begin drafting legislation. While our agenda will look pretty different given the results of the Presidential contest, I have faith that there will still be many ways we can move Colorado forward. Over the last 18 hours, I have been reminding myself that democracy was never supposed to be easy. This struggle to improve the lives of our fellow travelers is a struggle that will go on forever. We must all renew our commitment to working for our ideals knowing that our progress will be limited, our purpose will be called into question, and our journey will often face setbacks as we seek to ensure that this long arc of history continues to bend toward justice. And I love that even in the toughest moments, when we’re all sweating it – when we’re worried that the bill won’t pass, and it seems like all is lost – Barack never lets himself get distracted by the chatter and the noise. Just like his grandmother, he just keeps getting up and moving forward…with patience and wisdom, and courage and grace. And he reminds me that we are playing a long game here…and that change is hard, and change is slow, and it never happens all at once. But eventually we get there, we always do. As we reflect on what’s happened and plan for the future, may we all move forward with patience, wisdom, courage, and grace. Christopher Hadsall, Republican, 44.14 percent. About Kennedy: A structural engineer by trade, Kennedy has spend the last six years working as a legislative aide and policy assistant at the state legislature. He holds a master ‘s degree in political science, and a bachelor’s degree in engineering. 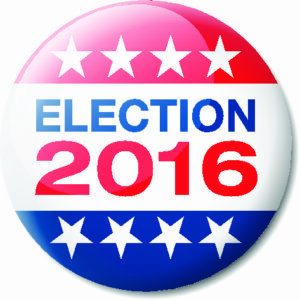 In 2011-12 Kennedy served as the Chair of the Jeffco Democratic Party. Read the rest of the questionnaire at LakewoodSentinel.com.